#irishsailing – After five years of economic contraction, there are signs of recovery, and the 2014 Irish sailing season has also got off to a flying start. W M Nixon looks at various signs of new energy and initiatives, and sees how they might be affecting stories which have been run on this blog and in the Afloat.ie website during the past year. But he concedes that further cost reductions will be necessary for the good of the sport. A year ago, any talk of green shoots in Ireland was almost entirely metaphorical. And it was in the economic sphere, though even there they were still few and far between, with many soon stunted. But out in the farmers' fields themselves, out where the grass should have been growing, there was scarcely a sign of life as we were still trapped in the coldest and most miserable Spring in living memory, and all forms of growth and recovery were blighted by it. 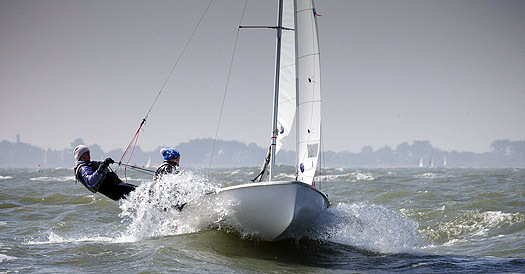 Sailing and boating, of all sports, are the most affected by Ireland's climatic conditions. Not only is the mood among participants strongly influenced by weather which sometimes can get anyone down, but without reasonable breezes, sailing events are seriously impaired. "We got a result!" may well be the PRO's final desperate claim after pulling some sort of a points table and leaderboard out of a series bedevilled either by too much or too little wind. But it's so much better to have a series bathed in sunshine and blessed by fine breezes, with enough races sailed for the crews to go home tired but happy without needing recourse to any of those weasel words which show you're only trying to justify a weekend of frustration. Things could not be more different this year. The Spring of 2014 has been perfection, boats are going afloat on time and in reasonable weather conditions, and the first little crop of events and results are very encouraging indeed - so encouraging, in fact, that "little crop" doesn't do them justice. That said, two of the nearer events which gave special cause for Irish celebration did not have perfect weather throughout. The Youth Sailing Nationals at Howth may have ended on a high with a great breeze in an early taste of summer sunshine, but one day out of the four was lost to bad weather. But the sting of that was lessened by the decision for "no racing all day" being taken at 1100hrs, which allows other leisure options to kick in. The IRC Easter Championship in the Solent concluded through Easter Monday literally with "Darkness at Noon" – the heavy clouds and torrential rain on an almost windless day saw the final races being sailed with nav lights on. But there had been excellent racing on earlier days, and a very excellent result with Anthony O'Leary's Ker 39 Antix from Cork the clear supreme champion. That in turn augured well for Ireland's Commodore's Cup chances, which then received a further boost last weekend when the crew of another Irish team wannabe, Quokka with Michael Boyd and Niall Dowling, had a winning weekend in the Warsash series with their temporary mount Tarka in anticipation of Quokka's return from the Caribbean at the end of May. Meanwhile the universities racing has been brought to life, for although UCD had a convincing win in the racing with the SailFleet J/80s to become the Irish team for the Student Yachting Worlds in France in the Autumn, before April was out the Colours Match in the Liffey under the burgee of the Royal Alfed YC, team-raced in Fireflies, saw Trinity take the honours in convincing style. But if we're looking for something which really did set things freshly alight, it was out in Hyeres where the ISAF Championship saw the northern duo of Ryan Seaton & Matt McGovern take silver in the 49er, almost immediately moving them up the global rankings from 33 to 11, a quantum leap and no mistake. 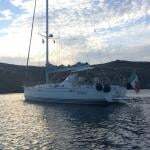 The potential for serious success by these two has been fairly obvious for some time, but anyone who sails boats will know only too well how many factors have to come into alignment to get you up among the magic metals at the end of the day. Stars of the silver sea – the Seaton/McGovern team took a silver medal for Ireland at Hyeres. That their new global status was almost immediately acknowledged by this rankings improvement will in turn add heft to everything they do and say. Thus when, some time ago, the Ryan/Seaton equipe suggested that the 2016 Olympics sailing waters in Brazil are so off the standard as to be a health hazard, it attracted polite attention. But now that they're Number 11, and still counting down, much more notice is taken. And the fact that the Vice President of the International Olympic Committee has suggested, with something approaching despair, that the facilities in Brazil just aren't going to be ready for 2016 at any standard, all gives added legs to the statement from Ireland's 49er crew. This in turn makes us wonder where world sailing might go in 2016 if the Brazilian setup is still Work in Progress. 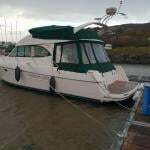 With tongue only slightly in cheek, we suggest they need look no further than West Cork, where Baltimore Sailing Club has been expanding its facilities to meet increased demand as a club which last year introduced something like 700 people to sailing. That BSC and current Mitsubishi Motors "Club of the Year" Kinsale YC further east along the West Cork coast have both been putting in premises up-grade during the past year, while other clubs have been having it tough, and just about hanging in there in some cases, surely gives pause for thought. Olympic venue? The extended and up-graded Baltimore Sailing Club is ready and raring to go. The economic shakeout of the past five years has caused a massive write-down in the value of almost all property and other assets. And in the case of yacht and sailing clubs, there has been a detailed examination of the continuing validity, or otherwise, of established yacht clubs and their traditional business model of quite high subscriptions under-writing other facilities which in turn combine to provide the complete package of an orthodox yacht club. Inevitably, most clubs are run by officers and committee members who have been involved with the club for many years. Thus, like people who have been running a quality hotel for decades, they may have an inflated notion of what their organisation and its premises are actually worth. Admittedly there's only limited usefulness in comparing a yacht club with a hotel, but lessons can surely be learned. The fact is that hotels today are worth maybe only a third or even less of what they were reckoned to be worth six years ago. And equally, while yachts clubs certainly have a unique package to offer, is it unusual enough and special enough to charge high subscriptions when there are alternative facilities and services available? The dilemma arises to some extent in all sailing centres. Last week we were discussing the story of the development of Howth YC. Today it is in the seemingly happy situation of having its own marina, thus it theoretically can offer an attractive all-in-one package to any potential member. But the very fact that Howth YC has done so much to help make Howth a colourful and vibrant sailing/fishing port is partly to its own disadvantage. The place has developed as a remarkable focus for top seafood restaurants. This means that the extensive club catering facilities – expected by traditional members - are constantly battling for business with a whole slew of award-winning eateries and characterful pubs nearby. The problem is more acute in Dun Laoghaire in that the only club within the marina area is the Royal Irish YC. Thus while people may have been loyal members of the National, the Royal St George and the Dun Laoghaire Motor Yacht Club, they find that after going out in the boat, it's very easy to round out the evening aboard in the marina, chatting among themselves or with other crews on boats nearby, and then head straight for home without making their number in their home clubs at all. This situation is less in evidence at weekends and during special events. But nevertheless it was causing such a lessening in mid-week club vitality that various steps have been taken, and the Royal St George's move to take over berths in a block booking in the outer marina, and service them by a frequent ferry direct from the clubhouse, is a visionary step. To overcome a lack of direct access to the Dun Laoghaire Marina, the Royal St George YC is running a ferry service from its clubhouse (to right of Stena Ferry, foreground) to the berths in the Outer Marina (upper left) Photo Kevin Dwyer/courtesy ICC. Nevertheless, in all club administrations there are those who are of the opinion that, whatever the Honorary Treasurers may believe, there has to be a radical re-think of the primary subscription levels. In essence, they're suggesting that the book value of the club has to be written down such that subscriptions are halved. Personally, I haven't much of a notion of how to read a balance sheet, but the dogs in the street know that in the hospitality industry – which, in the broadest sense, is the area in which yacht and sailing clubs operate – values have been savagely slashed, and while charges may still seem high, at least the places are surviving as going concerns. With continuing reduction in expenses across the board, one area in which there seems to be much work afoot is in the Irish Sailing Association, which in latter days had begun to seem like some hidden corner of the civil service, existing more for the benefit of staff than for the provision of services for sailors. It's amazing to learn that the ISA has sixteen fulltime staff, and a basic annual wages bill of something like €600,000. When you add in the expected benefits, it musty come in total to a very tidy yearly sum. What on earth do they all do? While you'll invariably find the ISA logo in prominence at some top events, it has to be said that you're entirely unaware of the organisation's existence in any form at more everyday happenings, and it doesn't seem to be because they believe in doing good work by stealth. But with special study groups resulting from the major changes introduced in the ISA setup at the AGM in March, we can only hope that in time the Association will reflect the cost-cutting which has had to be introduced in the clubs, which provide the main part of the ISA's income. While the administrative structures are rightfully being pared back in many areas of our sport, the coastal infrastructure, on which all forms of seagoing ultimately depend, continues to need maintenance and development. In this area, one very promising green shoot is the news that there are signs of movement in Dunmore East. A dredging programme is getting under way, and just this Tuesday, Minister for Marine Simon Coveney TD convened a meeting in the port to inaugurate a community approach to harbour development which, it is hoped, will help to invigorate the many places around Waterford Estuary, for which Dunmore East has the potential to be the true gateway harbour. In a more extreme marine environment, it has been confirmed that €6 million will be spent on improving the pier at Doolin in northwest Clare, the nearest mainland quay to the Aran Islands, which also caters for the tour boats cruising along the Cliffs of Moher. While the locals seem well pleased, I wouldn't get too excited about it. This is one very rugged part of the coast, and when you remember that it took €31 million to extend the pier at Kilronan in Inismor, the main Aran island, and another €14 million to build the little harbour at the north end of Inis Meain, the middle Aran island, then we can only hope that €6 million is going to achieve something more than a few boulders being shifted about in the roaring ocean at Doolin. But then, in the west all things are possible, and along the ocean seaboard we're told that four thousand signs are being erected to guide people along the Wild Atlantic Way, the new tourism initiative using many smaller coastal roads. Quite so. Frankly, with signage at this level, it will be the Tame Atlantic Way by the time half of them are in place. I have to admit to being a complete curmudgeon in this. In many years of transitting Ireland's west coast by sea and land, one of our favourite areas while driving along the west coast has long been the coast south of Kilkee down to Loop Head, where the cliffs comfortably rival anything the vulgar Cliffs of Moher have to offer, and it is magnificently uncrowded. But not any more, if the Wild Atlantic Way movement has its way. Be that as it may, the final sign that suggests things are on the move again is a notice I spotted recently posted at a nearby club, though language pedants might wonder how a notice which manages to mangle so utterly the plural of "dinghy", even to adding a completely superfluous greengrocer's apostrophe, could be seen as encouraging in any way whatsoever. Well, once you've overcome your opinions about the errors, the underlying message must be good news. More youngsters are evidently coming to sailing this year. And as for the spelling mistake, even that's an improvement. A year ago, the same notice board opened by referring to something called "a dingy", but this time round we have to get to the second line before finding that. And it all comes right for dinghies in the end.